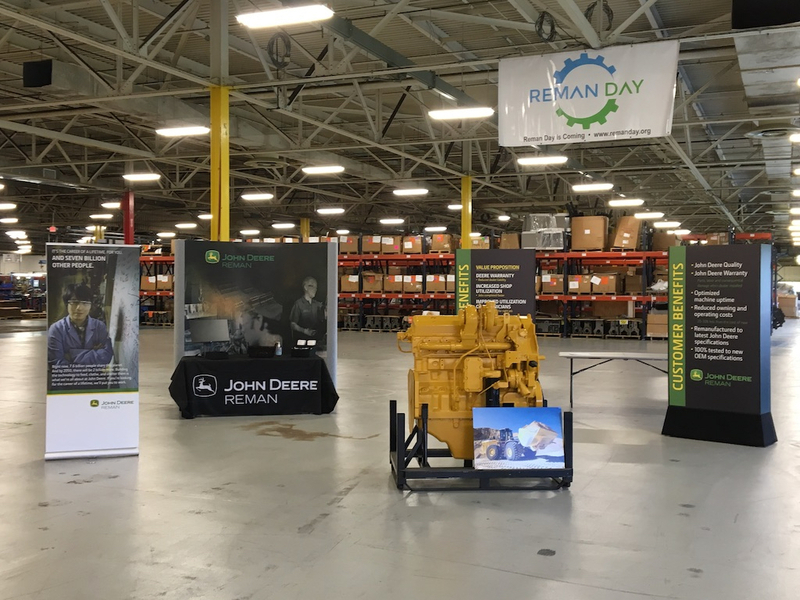 Continuing its efforts to advance the remanufacturing industry, John Deere hosted its annual Reman Day celebration, on April 11, 2019, at its remanufacturing facilities in Springfield, Missouri and Edmonton, Alberta, Canada, as well as at various units throughout the company. This year’s celebration focused on three primary themes: delivering value to the John Deere customer, quality and pride of workmanship throughout the remanufacturing process, and improving environmental stewardship. At the Reman facilities in Springfield, Missouri, the day began with an emphasis on hazardous material collection. Crews will be on site to collect and dispose of items such as paints, electronics, light bulbs, and oil. John Deere also invited local high schools to learn more about the remanufacturing process and how it benefits the environment. Students will receive a tour of the engine remanufacturing facility and learn more about various John Deere scholarship opportunities. Recently celebrating 20 years since the program’s launch in Springfield, Missouri, the John Deere Reman program has offered like-new exchange components since 1998. Previously sold, used or worn parts are restored from both a quality and performance perspective – and cost between 20-40 percent less than new parts. Remanufactured components such as engines, transmissions, axles, electronics and rotating electrical components are covered under a John Deere warranty. Through the remanufacturing processes of these components, John Deere Reman has prevented over 125 million pounds of landfill waste in the last five years, reducing energy and raw materials consumption, thus safeguarding the environment.